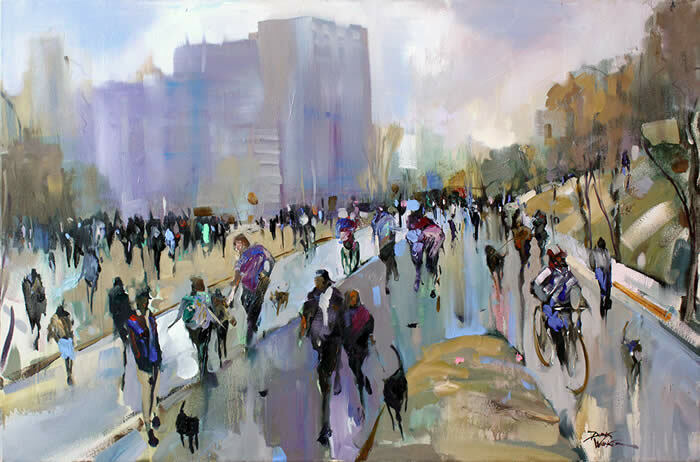 "The moment I first walked into Loretta Goodwin Gallery as a potential buyer, I realized my desire to learn the process of painting would be a priority in my life. Through an early friendship with several local artists I discovered the work and teachings of New York painter David A. Leffel, a Contemporary Master teaching at the very prestigious Arts Student League. A pupil of the Dutch and Flemish Old Masters such as Rembrandt, Velazquez, and Pushman; Leffel’s teachings of the chiaroscuro (light & dark) style of painting captivated me as a young artist. The interplay of light and shadow, through texture, shapes, and color transforms the simple and ubiquitous objects of everyday life into rich creations, and I knew the timeless quality of his work and those masters before him was how I would hope to paint eventually. "Through the years I have been so fortunate to meet and form friendships with so many wonderful painters from all genres as well as all parts of the country. I think as a painter I’ve learned little things from so many artists that have shaped and influenced my growth as an artist. I also have been blessed to have had a small role in the development of my younger brother Bart Walker, a Plein Aire painter living in Idaho.